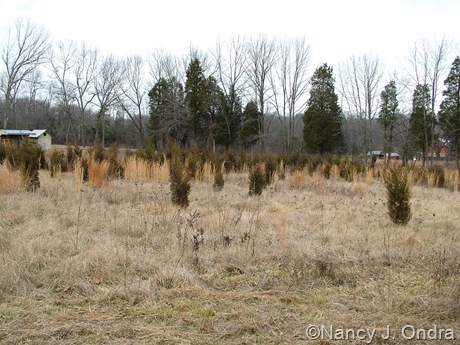 When I walked through the meadow in winter, though, I could see that hundreds of little Eastern red cedar (Juniperus virginiana) seedlings were coming up. I cut down many of them unintentionally when I did the yearly mowing, but there were plenty left. By Year 7 (below), they were tall enough to be visible over the herbaceous layer even in summer. I could see them well enough to avoid mowing them accidentally, but they were still small enough to run over with the brush mower if they were in the way or too crowded. The last few years, they’ve been growing quickly, and last winter, I suddenly realized that I’d left way too many of them, so they needed to be thinned out. But wow, what was I going to do with all of the excess cedars? I started contemplating the possibility of running them through a chipper to make mulch. I’d save the money of buying mulch for the garden and make good use of the extra cedars. I could harvest some of them each year, let new ones come up as needed, and have all the mulch I could use. The one problem with my plan was that I needed a heavy-duty machine to be able to chip up the harvested cedars, and that just wasn’t in my budget. The answer to that came last spring, when I was offered the opportunity to test and review a piece of power equipment from Troy-Bilt. 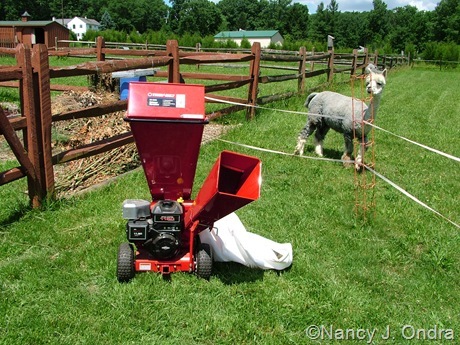 When I explained the project I had in mind, they offered to send me their most powerful chipper/shredder model: the CS 4325 Heavy Duty Wood Chipper and Shredder. 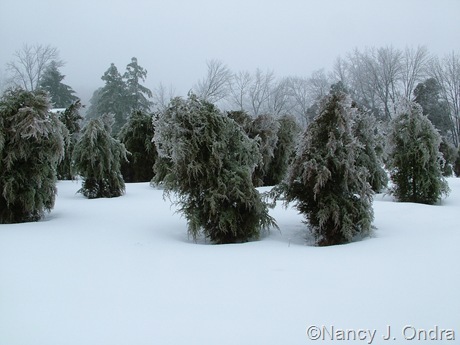 The specs said it could chip branches up to 3 inches in diameter, a size even the largest of the cedar seedlings hadn’t yet reached, so it sounded perfect. Knowing that the machine was on its way, I started stockpiling other materials to chip too: spring prunings from the shrubby dogwoods, hydrangeas, elderberries, spireas, ninebarks, and willows. My first impression was that it was difficult to move around. Granted, it does have a convenient handle at the top for tilting and moving it by hand. There’s also a detachable tow bar in case one has a garden tractor to hitch it to. However, the axle is so close to the ground that it was difficult to drag the unit over my less-than-perfectly-smooth bark paths and grassy areas without the base catching on bumps and dips. Once I got it in place and reviewed the user’s manual, I was ready to see what it could do, and it started on the very first try. I’m not the bravest soul around large, noisy machines that contain spinning bits of metal, but I quickly became comfortable around the unit because it seemed so sturdy and simple to use. In no time, I was feeding the stockpiled prunings into the chipper chute. The pieces shot into a detachable collection bag, which made cleanup very easy. The material was chipped into smaller pieces than I expected and was generally very uniform. It made a nice-looking mulch for the nearby vegetable garden paths, though the small pieces shifted underfoot and were a little tough to walk on. I think the chipped material would be much better for use as a mulch on the garden. In the process of chipping those prunings, I realized two things that made me decide that my make-your-own-mulch project wasn’t going to be practical. First, while the machine can indeed chip sizable branches, the chute that feeds into the chipper section (the chute angled toward the left in the photo below) is rather narrow, especially toward the base. If you’re putting in fresh prunings with slender, very flexible side branches, you can get them to feed through or gently push them through. But prunings that have curves or woody side branches have to be hand-trimmed further before chipping. Granted, the instructions do explain about this, but I didn’t realize how much more work I’d have to do to get the prunings ready for shredding. I finally shut off the machine and spent a few hours trimming the rest of them down to straight pieces. It ended up taking me a total of 6 hours to prepare and chip all of the prunings that I had stockpiled, and I ended up with a very small amount of mulch as a result: barely enough to fill three wheelbarrows. Seeing that result made me really understand what the specs meant by a “10:1 debris reduction ratio.” Sure enough, I’d say that chipping is an excellent option for reducing piles of woody garden waste (and stout herbaceous stems such as corn and sunflower stalks too). But to get anywhere near the amount of mulch I was hoping for, I’d probably have to harvest all of my excess cedars at once, and it would take me months to trim off all of the side branches into small enough pieces to feed through the chipper. Factor in the time spent on the actual chipping, and the gasoline used too, and it’s easy to see that my self-made-mulch plan was not practical. So, then what? I still had plenty of other garden debris to deal with: partially decomposed compost, fresh perennial prunings, and loads of the twiggy bits that were left from trimming the woody prunings to make them straight. Running them through the shredder seemed an obvious solution. Unfortunately, that didn’t work out very well either. I’d used a shredder before, so I knew better than to dump whole armloads of stuff into the hopper, even though it’s huge and looks like it could handle a lot. But it narrows at the bottom and then turns just before the blades, so even small pieces got stuck if they were at all bushy, and the chute is so tall that it was really hard to get a stick down there to clear the jam. 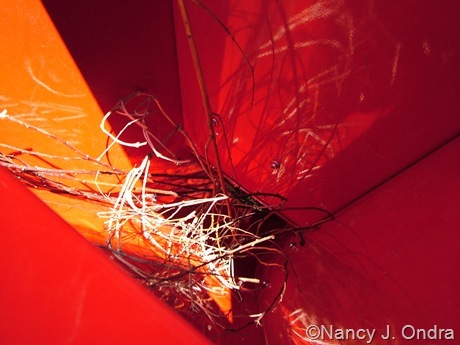 I eventually gave up on trying to shred for the spring but was determined to try again in the fall, when I did the garden cleanup. Unfortunately, that part of the test was a disappointment too, because I couldn’t get the engine started. I tried all the tricks I knew but finally admitted defeat and hauled the machine back into the storage shed. I’ll figure out what to do with it in the spring. You can imagine how awkward it is to not be able to write a rousing review for a product that was so generously offered by a company with such a good reputation as Troy-Bilt. (If you’re interested in reading other reviews, you can find a bunch here at the Troy-Bilt site and here on Amazon). It’s a good lesson to really do your research before you choose a piece of equipment, to figure out if you absolutely need it and if you do, which features are most important for the job you hope to accomplish. 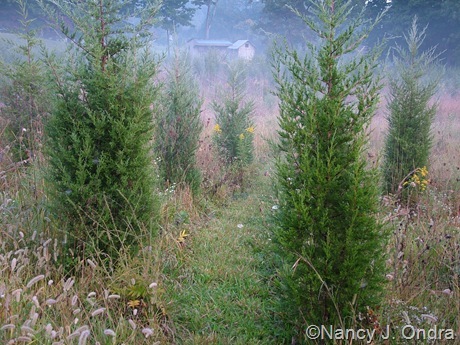 Now, what am I going to do with all of my excess cedar trees? I have a new project in mind: building brush piles. I don’t exactly need more wildlife habitat, but I think it might be the best way to make good use of the surplus. So far I’ve found some intriguing ideas at Brush Piles for Wildlife and Wildlife Management: Brush Piles, including the concept of a living brush pile, which sounds like a perfect option for the meadow. So it looks like I’ll be working on some new experiments this year – once the snow and ice disappear, anyway. That could take a while. It’s always so tempting to hope that one can use one’s own woody plant prunings as mulch. It would be such a nice green recycling option, but when you really need lots of mulch it just does not provide you with enough. Our solution has always been to buy by the dump truck load from a tree service. Excellent idea, Yvonne. That’s a good compromise between trying to make your own and buying finely shredded material that’s been hauled and loaded and unloaded multiple times. 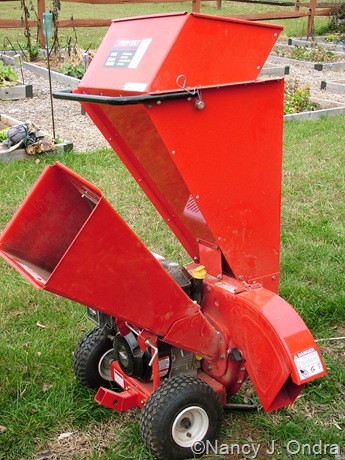 It seems that a chipper/shredder is best for smaller gardens where you need to get rid of a lot of debris. But then, it’s a sizable and expensive machine to have around for just a few hours of work each year. This was a very helpful post. 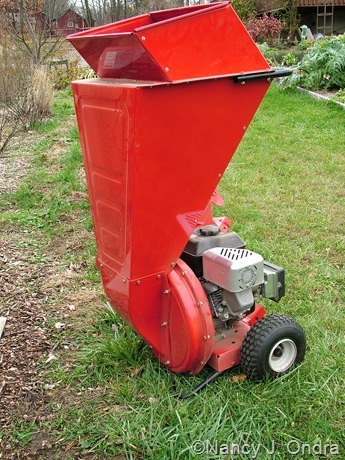 I was thinking about purchasing a chipper, but your article made me question my assumptions about them. Of course, it can be helpful, but not in the way I imagined. 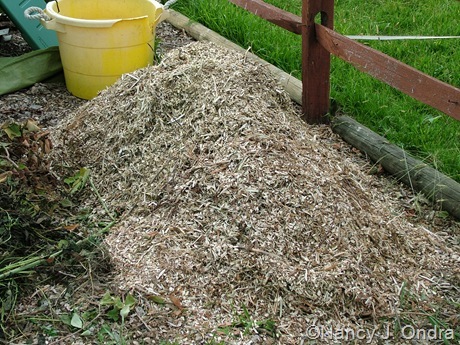 The other difficult question is what to do with all the woody pulp that a shredder creates. The cellulose and hemicellulose in the non-bark part of woody plants actually robs nitrogen from the soil as it decomposes. Not a problem for a mulch path, but definitely a problem for mulching around garden plants. I love your idea of creating micrhabitats with it. Nice post, Nancy! Thanks, Thomas. Renting a chipper as needed might be an option to consider. 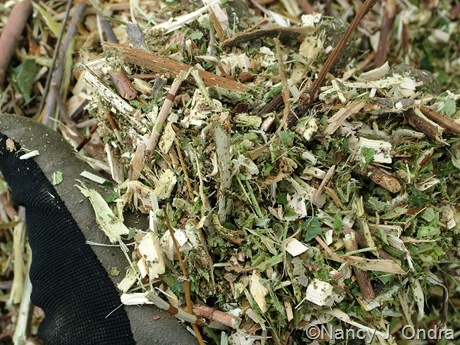 The chipped material would be great for composting, too, especially if you chipped up fresh woody prunings. Your experience is similar to mine. I bought a chipper shredder, found it too much work and made too tiny of a pile to be practical. After a year I sold it for a tiny fraction of what I paid. I now get shredded wood for my paths delivered by dumptruck, and I get horse bedding for mulch by the pickup truck. I get the quantities I need and it’s so easy. Re Thomas’s comment, studies done by Cornell and others refute the idea that wood mulch on the surface robs nitrogen from the soil. If you mix it in with the soil as an amendment, that will rob nitrogen, but if it’s laid on top it doesn’t. So mulch with abandon. Thanks for commenting on the nitrogen issue, Brenda. I will say that though my homemade mulch idea didn’t work, I’ve had great success with my home-produced soil amendment system. Two alpacas provide a good amount of humus-building manure all year round! It’s eco-friendly, though from my perspective, it would be cheaper and less time-consuming to buy it. It sounds like you had much of the same problems we had with a smaller chipper. I often wondered if a larger chipper would be better. Glad we didn’t invest. 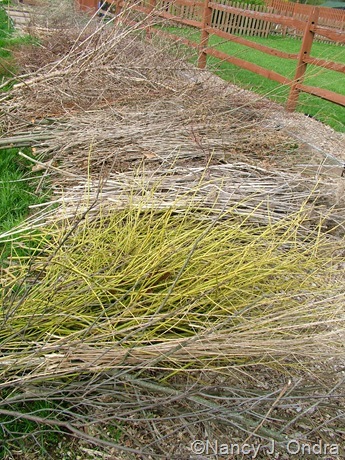 Wildlife piles do break down into mulch and humus. It just takes longer. It definitely wasn’t the size of the machine that was the problem; mostly, it was my unrealistic expectations of what it could do. The brush-pile route will take up more space and take longer, but it will be a lot quieter and not use any gasoline, either – two big advantages. I often wish that I had a wood chipper – one that can chip fresh as well as dead branches just as efficient as the big ones that the utility companies use when cutting down trees along the road. I do realize, though, that the amount of wood that I have to chip on a yearly basis would not justify such an investment. I have thoughts about getting a used one for the tractor, if I can possibly find one. Hmmm…I wonder if it would be cost-effective to hire someone to bring a commercial-sized chipper by once a year? They could power through a large amount of prunings in no time and leave you a nice pile of mulch in the bargain. Same dilemma here. I am leaning towards hiring a arborist with a commercial chipper. The place I buy my mulch from advises a “double grind”–having them run the material through twice–for creating the best mulch/compostable material. It seems we all have this same issue, no matter our climate, garden size, or choice of planting materials. At least it is a comfort to know we are not alone! Figuring out what to do with debris is definitely one of those non-fun aspects of gardening. I’m all for composting, but in my experience, it’s not a practical solution for the huge piles of tough, tall perennial and ornamental grass stalks from fall and winter cleanup. I really was hoping that shredding the stuff would make composting an option, but it wasn’t meant to be. My gardener and writer friend Gabriella Buccioli has a beautiful garden up in the hills above Bologna, and to keep deer and wild boars out of her property she built a nice tall dead hedge with branches, sticks, and all kinds of garden refuse. Because the structure she began with is tall and well-built, the overall visual effect is excellent, and the hedge provides more room for wildlife, even if she, like you, was already offering little creatures TONS of room in her garden and woodland. This year I hope to build one, too, and part of it will serve as a barrier between my goats and the garden. As you can imagine, I can only have one or the other in one area; goats and garden don’t mix! Maybe you’d want to try renting one, if you can, just to see what you think. I don’t want to say that a chipper is never a good choice, just that this one didn’t work out well for my situation. One thing I’d suggest looking for is a model that has the shredding chute directly above the blades. I used to have one like that and don’t recall ever having problems with the material getting stuck. I’m really intrigued by your description of your friend Gabriella’s fence. Are there any pictures of it on line? I’ll be interested in following your progress building one for yourself this year. It’ll have to be mighty dense, tall, and sturdy to keep goats out. Those critters are certainly adventurous! Of course, maybe they’d be more interested in nibbling on the fence, but they’d probably have great fun trying to climb over it too. Good luck, Clark! We started with a shredder , not happy, when offered Strelitzia leaves. Now we have a chipper because we grow a lot of shrubs and trees. We use the result to mulch around plants. NEVER had any problems with a mouldy green mess. Starts fragrant and green, then fades to brown fine woody chips. In Switzerland we didn’t have a garden, but the municipality used to put a notice in the newspaper, when they were bringing the chipper round. You put out your garden waste, and they gave you a heap of mulch back. Thanks so much for sharing your experience, Diana. I love the idea of a traveling shredder! Many towns around here do leaf pickup but usually don’t pick up brush, except for collecting Christmas trees after the holiday. It’s great when communities do composting, though it’s not very helpful for those of us who don’t have a truck to haul debris there and bring finished compost home. Having the shredder come to you solves that problem. Bummer about the chipper…I guess it’s one of those “too good to be true” sort of things. I’m totally leery of all power tools…the noise, the fumes…just don’t sit well with my delicate nature, I guess, haha. I’m considering renting a rototiller this spring for the back yard makeover…and I’m a bit leery of how I’m going to manage to control the beast! Yeah, Scott, the noise issue is a big one. I too try to avoid it as much as possible. Years ago, I bought a snow-blower attachment for my brush mower, but I haven’t used it much (even this winter), because shoveling is much quieter. Good luck with the tiller project! I have a chipper/shredder, too, and I find it quite intimidating working around a noisy piece of equipment with flailing blades. The chute only takes long branches. The hopper only takes soft things like leaves. I learned that the hard way. I tried to put shrub trimmings in the hopper and it jammed on the first try. I had higher hopes. 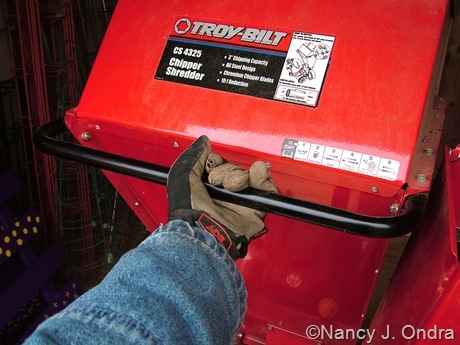 On mine, I found it much more tempting to use the chipper chute than the shredder hopper, because the opening of the hopper is so high. And I will say that it never truly jammed; it’s just that the material collected at the bottom of the hopper, so I had to turn off the engine and tip the whole machine over to be able to fish out the debris. I can imagine that clearing out a serious jam like the one you had in your shredder must have been a real pain. We had a small chipper when we lived in the suburb of Stockholm were we had a large hedge and lots of fruit trees. But I didn´t like working with it or using the mulch, it gave to large pieces. Here in the middle of the wood, my husband drive away the large parts to the “reclaming site”. Then I by a lot of mulching material instead. Easier and it also looks nicer! I can imagine that fruit trees would end up giving you lots of prunings to deal with, Susie. Purchased mulch does have the edge for uniformity and convenience. Almost all of my garden paths are bark-mulched, and I really like the look of double-shredded hardwood mulch for the ornamental areas. In the vegetable garden and orchard, I’ll use whatever I can get. Hi Nan, I’m assuming you’ve contacted the Troy-Bilt company. They are, as you say, a well-known manufacturer. I would say this review might spur them to help you solve your problem! Thanks for the suggestion, Shady. I don’t expect them to do anything more than they have by supplying the machine for the test. I see from reading other reviews that many other users are happy with this model. The not-starting issue was disappointing, because normally, I try to spread out my garden cleanup so I don’t accumulate huge piles of debris. Hauling all of that stuff back to the hedgerow at one time was a real hassle. But I figure that stuff like that can happen with pretty much any power equipment. Over a period of about 20 years, I have had three different models of chippers. All of them worked well in some capacity, but all of them also bogged down with certain materials. Each bog resulted in many minutes (and sometimes hours) in shutting it down, working the clogged material out, and rethinking how to proceed or giving up. (Don’t even think of chipping wisteria vines!) I am not sure it would make a difference whether the chute was directly over the blades or not; my experience suggests that all models have some problems like you experienced, perhaps just different. In order to have sufficient power, most models are at least 8 horsepower–which means that even for someone like me, a rather stout and musclar man, they are challenging to start unless there is some kind of electric start–and I have never seen such a option on the models I looked at. The result is that if the oil is cool/cold at all, it won’t like start–except if you take off the air filter, squirt in some ether, and quickly start it up. After many years of using chippers, however, I finally sold them at a garage sale–to the enthusiastic delight of my neighbors. Apparently, the noise pollution had bothered them for years when I used these chippers, and, while I wore ear protection, they did not. Now, chipperless, I find gardening much quieter, less mechanical, and somehow–greener. I think for me the potential ‘ideal’ solution would be some kind of neighborhood co-op or collective ownership that would allow acces to one when really needed, but otherwise, I don’t see chippers as really helpful to the individual grower. They take up a lot of space–and in retrospect, I see I used a lot of time keeping them going with maintence, ‘down’ time, and fuel. I’d say for many of us smaller gardeners, let the professionals use them, and we will hire them when absolutely necessary–or as you say, find another and quieter way to use our plant material. Your comments are really helpful, Dan. 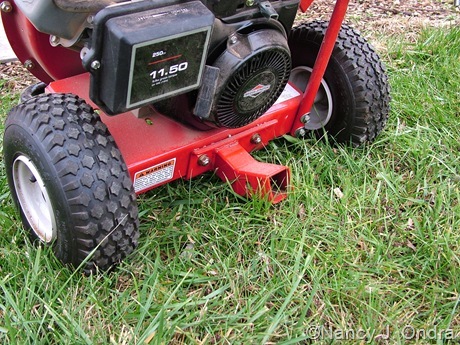 I’ve been thinking that my DR Brush Mower also has a Briggs & Stratton engine and has never been a problem to start, no matter what the weather. You’re right, though: it’s an electric start, not manual like the chipper/shredder. My neighbors never complained about the noise, but the thought of it bothering them did make me cringe. I feel the same way when I use the brush mower to mow my meadow, but that’s mostly just one time a year, except for the paths and the pastures. And I guess it’s not much worse than others’ mowers, dirt bikes, ATVs, etc. Thanks for this practical review, Nan. I load a pickup truck and take all my debris from pruning and cutting to the Bethlehem Yardwaste Facility. I have often thought it would be convenient to have my own chipper shreader. Now I know. I also get truck loads of compost or mulch there too at a minimal cost. I think I’ll count my blessings! Yep, I think your pickup truck was probably a better investment in the long run, Marie. What a great post.. As I clean up the garden debris, I often long for a chipper thinking about the piles of lovely mulch for my veggie pathways and to add to my compost bins.. you’ve woken me up to the workload though! Good to know.. It wouldn’t be as easy as I think it would be.. Thanks, Niki. Yeah, it’s never easy, is it? 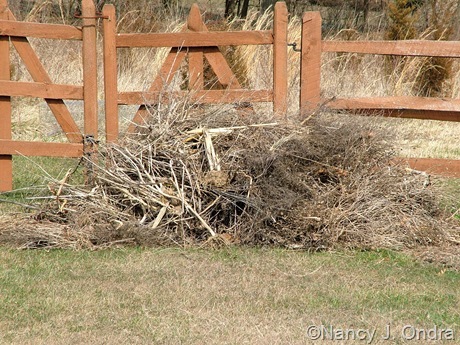 I think brush piles have many advantages over chipping, at least for those of us who have the room for them. I’m a bit concerned about the piles providing habitat for voles, though, after all the effort I’ve put into trying to keep the critters out of the garden. I had the exact same experience with our chipper. With all the snow we had last year our old junipers fell apart. We too wanted to chip them so that we could use them as mulch. It was a LOT of work, for such a small amount of chips. Plus we seem to have broke the chipper in the process. Instead, I called our local arborist and he offered to drop a truck load of wood chips for free. He always has a surplus and like to dispose of them this way versus bring them to the dump (where I do think they compost them???) 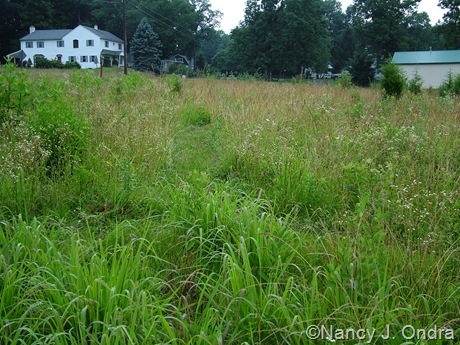 Also, I am doing the same with part of my property with the meadow. It’s been six years and I have no cedars popping up, but I wish that I did. I can understand why you would want to thin them out, but I LOVE that look! Thanks for reading and for sharing your experience, GG. 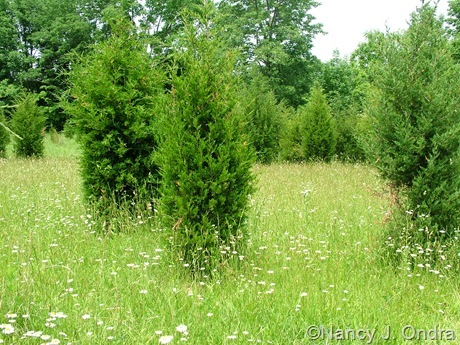 Are you sure you don’t have any cedars in your meadow? It seemed to take a few years for mine, but the seedlings must have been in there well before I noticed them. As far as thinning them…well, I have yet another idea in mind at the moment: limbing them up on the inside of the groupings to create tunnels to walk through. I’ll see if that’s a viable option once things melt a bit more. Your meadow is lovely. How do you keep the goldenrod from taking over? I manage a meadow for a couple clients up here in Vermont and that’s always the big problem: The goldenrod eventually starts taking over. I do have some large patches of goldenrod, but I like it, so it’s not a problem for me. The cedars – and the switchgrasses and milkweeds, too – seem to compete with it just fine, and there’s still lots of diversity here. I wish I had a helpful suggestion for you, David! I’m envious, Rhonda! You’re so lucky to have so much wonderful mulch available. over the past two years i’ve let a large portion of backyard go native. it looks similar to yours. the most notable difference is instead of being over run by cedar, i’m battling goldenrod. 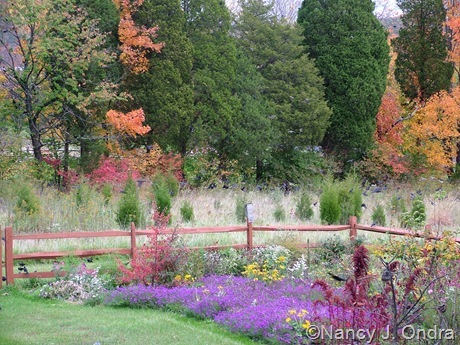 i’ve introduced different flowering plants/shrubs to my field but they are having trouble competing. this fall i tried cutting down all the g.rod in hopes of short circuiting the reseeding. hope it was worth all the effort. by the way, if you have a lot of woody stemmed things that don’t compost readily, just find a low spot in the landscape and fill it in. eventually it will break down-and level the depression. Interesting that you’re the second person to mention having a problem with goldenrod. I’m guessing that fall mowing won’t make much difference, since it’s coming back from perennial roots rather than seeds. Mowing the goldenrod patches weekly for a season or two would probably do more to slow the spread.